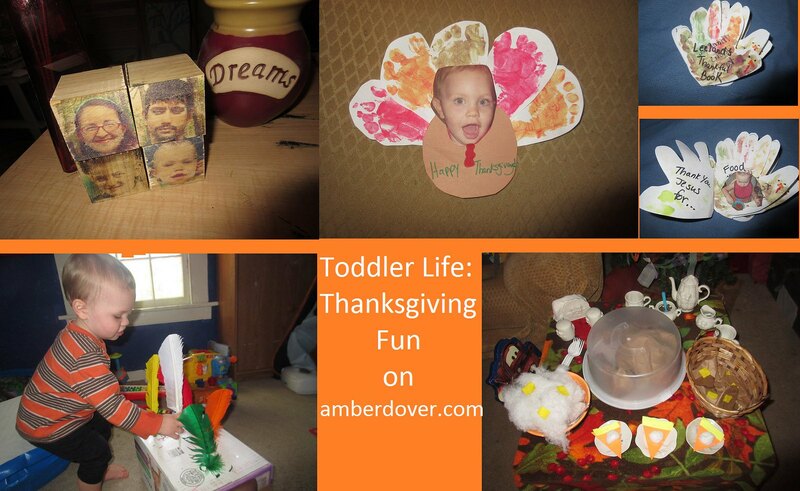 In this post: Thanksgiving crafts, activities, and pretend! Hello, dear ones! I pray you’re having a blessed holiday. Even if your country doesn’t celebrate Thanksgiving, you can take a moment to count your blessings. I believe counting our blessings each day helps us become content and joyful people. Leeland is still too small to understand the concept of Thankfulness, but I think it’s good to build a foundation when kids are young. Kids also learn best through play. So we have lots of play in this post. Enjoy! Turkey Foot Print Craft~ We sent these to grandparents. Turkey Feather Game~ I printed out a large copy of Leeland’s face to make him our turkey. Then I poked holes into a box and stuck colorful feathers in them. He had lots of fun taking the feathers in and out. I was surprised with how long this game kept him occupied. Thankful Jars & Thankful Activities~ Meanwhile, the rest of the family wrote down our blessings in our thankful jars, and Michael chose a thankful activity each day. Fall Magnet Fun~ I got these Autumn themed magnets at the Dollar Tree. Leeland’s magnetic board is great for trips. Leeland’s Thankful Book~ I used Leeland’s handprint to make a turkey book. Inside I put all the things he should be thankful for. I strung the book up and put it on our Thankful tree as an ornament. An Early Thanksgiving with our Homeschool Group~ We had a feast with our group and took home a turkey plate craft. Michael turned his turkey plate into an ornament for the Thankful tree. You can see other turkey ornaments he’s made. Thanksgiving Pretend Play~ I made the turkey with paper bags. The mashed potatoes are cotton with felt butter. The rolls are paper bags, and the pumpkin pie is construction paper with a cotton ball glued on. The kids had snacks and watched a Charlie Brown Thanksgiving while playing. Family Blocks~ I printed our pictures on wax paper and rubbed the ink onto the wooden blocks that Chris had cut out. I plan on making blocks with our extended family on it too. A get together with our best friends, the Chambers Family. My best friend Hannah had her twins a couple months ago and now they have five kids. All of us held a twin at one point. Chris got baby fever lol! the little kids danced in Leeland’s room! Just for fun…the boys blowing bubbles.